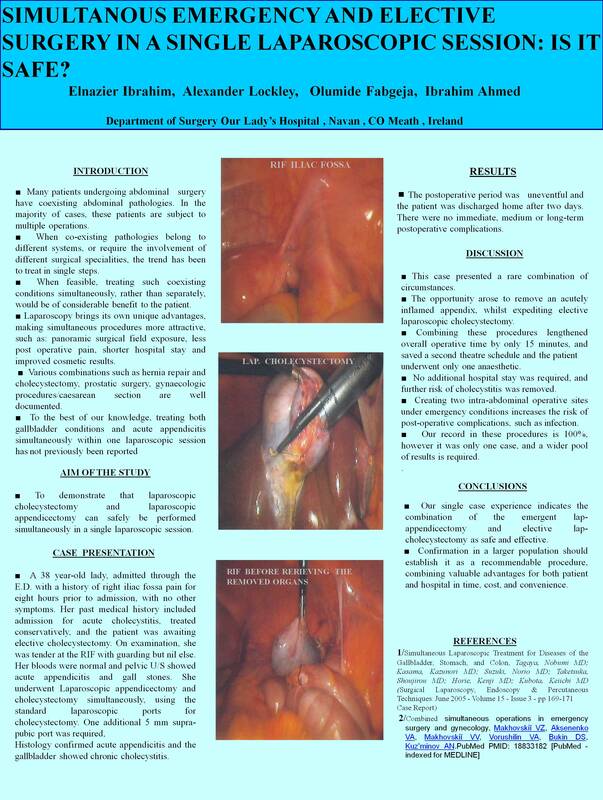 Simultanous Emergency and Elective Surgery in a Single Laparoscopic Session: Is It Safe ? Introduction:Many patients undergoing abdominal surgery have coexisting abdominal pathologies. In the majority of cases, these patients are subject to multiple operations, via the same laparoscopic or open approaches. When co-existing pathologies belong to different systems, or require the involvement of different surgical specialities, the trend has been to treat in a single anaesthesia. When feasible, treating such coexisting conditions simultaneously, rather than separately, would be of considerable benefit to the patient. The patient endures fewer procedures, thus reducing psychological and physiological stress, by obviating repeated anaesthesia. The benefits extend to the hospital, as length of stay and number of hospital admissions is reduced. In addition, Laparoscopy brings its own unique advantages, making simultaneous procedures more attractive, such as: panoramic surgical field exposure, less post operative pain, shorter hospital stay and improved cosmetic results. The concept of certain combined procedures is well documented. Such marriages include various combinations of hernia repair and cholecystectomy, prostatic surgery, gynaecologic procedures/caesarean section. The list extends to include various combinations of bowel, urological and vascular procedures. To the best of our knowledge, treating both gallbladder conditions and acute appendicitis simultaneously within one laparoscopic session has not previously been reported. Aim: To demonstrate that laparoscopic cholecystectomy and laparoscopic appendectomy can safely be performed simultaneously in a single laparoscopic session. Case Presentation: A 38 year-old lady was admitted through the E.D. with a clinical diagnosis of acute appendicitis. Her past medical history included admission for acute cholecystitis, treated conservatively, and the patient was awaiting elective cholecystectomy. The clinical diagnosis was confirmed by pelvic U/S and the presence of gall stones was again noted. She underwent Laparoscopic appendectomy and cholecystectomy simultaneously, using the standard laparoscopic ports for cholecystectomy. One additional 5 mm supra-pubic port was required, and the two organs were retrieved with an endo-bag through the umbilical incision. Histology confirmed acute appendicitis and the gallbladder showed chronic cholecystitis. Results: The postoperative period was uneventful and the patient was discharged home after two days. There were no immediate, medium or long-term postoperative complications. Discussion: This case presented a rare combination of circumstances. The opportunity arose to remove an acutely inflamed appendix, whilst expediting elective laparoscopic cholecystectomy. Combining these procedures lengthened overall operative time by only 15 minutes, and saved a second theatre schedule and underwent only one anaesthetic. No additional hospital stay was required, and further risk of cholecystitis was removed. Creating two intra-abdominal operative sites under emergency conditions increases the risk of post-operative complications, such as infection. Our record in these procedures is 100%, however it was only one case, and a wider pool of results is required. Conclusion: Our single case experience indicates the combination of the emergent lap-appendectomy and elective lap-cholecystectomy as safe and effective. Confirmation in a larger population should establish it as a recommendable procedure, combining valuable advantages for both patient and hospital in time, cost, and convenience.